Insulin Pumpers UK: Which pump? This page has basic information: you are encouraged to visit the comparison table at the Insulin Pumpers US site, and companies' own pages to find the details. I have tried to identify the unique selling points of each pump. Different features will be more or less beneficial (or irritating) for different users; unfortunately, it will take you some months of pumping before you find out what kind of pumper you are! Cozmo currently has no distributor in the UK selling the pumps. However, they are supported by Smiths Medical. Smiths Medical are not looking to place pumps into the UK market for the time being, apart from into existing Deltec trained hospitals, as they have no support staff of their own. They are looking to bring the Cozmo back to the market at some point in the future, as yet undefined. Smiths will continue to support existing pump users with supplies etc. including the new Cleo infusion set. 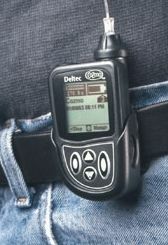 US website: Deltec Cozmo distributed by www.cozmore.com. 48 rates per profile - ideal for someone who has need for different amounts of insulin at different times (if Lantus is a nightmare for you, this may be the pump for you). 4 different profiles - good for someone who has different profiles at different points in a menstruation or shift cycle - also look at the Spirit if this concerns you. Temporary basal can be set for up to 72 hours - ideal for someone who finds that they regularly do something which changes their insulin needs for this long. Choice of the step in boluses - up to 5 units per step, and total bolus of 75 units - ideal for someone who needs to give extremely large boluses. 1 unit bolus takes from 1 to 5 minutes - ideal for someone who makes mistakes and wants to catch them, and, I hear, more comfortable for those taking large boluses. You tell it your blood glucose or how much carb you've just eaten, and it will suggest what you should bolus. And if you've still got insulin on board from a previous correction, it will take that into the calculation. Even more clever: it will tell you if you have not bolussed for a meal! Ideal for forgetful types, and those who count on their fingers... Even better... Coming soon! A BG meter which will tell the result direct to the pump (look at the Paradigm if you want this feature now). Waterproof - ideal for sports-people, and some swimmers (i.e. those who find they can't cope with being pumpless while swimming). Cozmo is fine for normal swimming. Probably the only pump on the market which you can programme from a PC (check out the Paradigm, too, as you can certainly download from pump to PC, and may be able to upload to the pump, too). Note also that the pumps shown on the US site are the next generation, which is not much different to the generation currently on sale in the UK: the main differences is the newer pumps have the feature where you can give bolus by common foods, the older ones only allow carb content or insulin units, and it will give you a different profile every day of the week, if you want that. 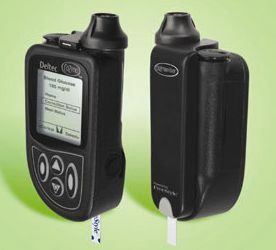 The Accu-Chek Spirit pump is manufactured and distributed by Roche Diagnostics. Roche have taken over the pump operations of Disetronic. The Spirit has a unique three menu operating system which will allow the user to choose from 3 pre-set menus - Advanced, Standard and Custom. The Standard menu is ideal for new starters who want to master the basic functions before moving on to some of the more advanced functionality (or even those experienced pumpers who only use a limited number of features). The pump does not have a remote control, but has two unique tactile buttons that allow for accurate dosing through your clothes, thus allowing for you to be discrete in public. 5 different basal profiles - ideal for someone who has different profiles at different points in a menstruation or shift cycle. Bolus will step up in 0.1, 0.2, 0.5, 1 or 2 units - ideal if you want one of those steps. Sold as a one pump set with the opportunity to buy a second subsidised pump as a back-up for those with who may require the extra security and convenience. Ideal for those who go beyond the range of mobile phones and next-day courier services. Possibly reassuring for those who never venture outside Greater London, but are nervous, or know something about the UK transport infrastructure that the rest of us don't. 6 year warranty - all the others have 4 years. A hand help pump and blood glucose management system called Pocket Compass links in with all the Accu-Chek pumps and meters to help you review and manage your control and trends. It will also have the functionality to help you with dosing calculations. There is also a PC interface which will allow you to programme the pump. Has a good waterproof spec for up to an hour - possibly a good choice for those who find they can't cope with being pumpless while swimming - but not one for water sports people. However, the manufacturer insists that it is good practice to remove it before swimming as a precaution. 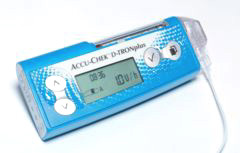 The Accu-Chek D-TRON Plus pump is manufactured and distributed by Roche Diagnostics. Roche have taken over the pump operations of Disetronic. Only insulin pump on the market that uses prefilled insulin cartridges (Humalog). This may be a useful function if you find it hard or cumbersome to self fill cartridges from vials. Only 2 different profiles - may not be ideal for someone who has different profiles at different points in a menstruation or shift cycle. Bolus will step up in 0.1, 0.2, 0.5, or 1 units - ideal if you want one of those steps. Pump only recalls last 10 boluses, 10 alarms and 7 daily totals - perhaps not ideal for someone who wants to check back over results but you can check back last 1400 on the PC - so perhaps only a drawback for those few statistic-lovers who don't have a PC! Supplied as a 2 pump set rather than a one pump set - so you have your back-up already. Again, a feature that some people will find useful. On the other hand, though, it takes proprietary batteries - all the others take AA/Lithium or AAA - so if you're stuck without a battery for this pump, you're stuck - with another pump, you just have to find a chemists/photography shop - so you are probably better with the Spirit if the two-pumps feature is what is attracting you to the D-tron. The largest pump due to the prefilled cartridge feature - not the best choice if you want to wear the pump under clothing. Also, at just over 4 ounces, an ounce heavier than most other pumps - probably not a consideration for many, but might be important for a small child. Splash proof - the manufactures recommends that it is removed for swimming, showering or bathing. The Paradigm 512 and Paradigm 712 are similar pumps, but the 712 holds more insulin. 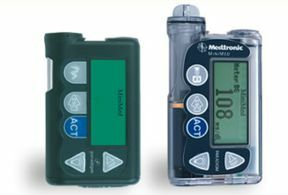 Websites: www.minimed.com or www.medtronic-diabetes.co.uk (no email contact, only form contacts on both websites). 48 rates per profile - which would seem ideal for someone who has need for different amounts of insulin at different times. The Paradigm pumps deliver insulin in 'lumps' of 0.1 units, whereas the other pumps split bolus delivery across the hour: so possibly not a good pump for someone with a daily insulin total under 30 units (with a Paradigm, an hourly bolus of 0.3 units is delivered, for example, at 3 20-minute intervals, other pumps will deliver it at 3-minute intervals (slightly slower for basal rates under 0.1 per hour). You tell it your blood glucose (or let your meter tell it your blood glucose!) or tell it how much carb you've just eaten, and it will suggest what you should bolus. Ideal for those who struggle with mental arithmetic, and those who don't remember what the BG reading was as soon as they close the meter down. Has a remote - this means you can tuck the pump underneath layers of clothing. Ideal for people who wear dresses without pockets, or who work in environments where they can't 'get at' their pump. Unlike the other pumps, which use what is called a 'luer lock', only sets designed for the Paradigm will work with the Paradigm (although you can now buy a special reservoir that will allow you to use other sets with it). This will only be an issue if you find you are allergic to all the Paradigm sets... ask for samples of Paradigm and generic sets before making this choice if you think it possible you will react. You can take the inserter needle out of the set, and apply the sticky bit to yourself, without having to be pump-trained. Not certified as waterproof. If you go swimming you must take the pump off, or put it in a special waterproof casing. Only 12 rates per profile - not ideal for someone who has need for different amounts of insulin at different times (if Lantus is a nightmare for you, this pump may not be the one for you). 4 different profiles - ideal for someone who has different profiles at different points in a menstruation or shift cycle. Small step in boluses - 0.05 units. See also the Cozmo. Ideal for someone who has small boluses. Bolus speed adjustable (no data on how, though). You tell it your blood glucose or how much carb you've just eaten, and it will suggest what you should bolus. Even more cleverly, if you've still got insulin on board from a previous correction, it will take that into the calculation. Sounds ideal for those who struggle with counting. Has a reminder feature - ideal for the forgetful or busy. Waterproof - ideal for sports people, and some swimmers (i.e. those who find they can't cope with being pumpless while swimming). Suitable for scuba/subaqua. Only 200 units capacity (all others have 300 units). Coming soon! A computer interface - programme your pump from the comfort of the large screen on your PC (if you want this feature now, check out the Cozmo - the Paradigm allegedly has this too, but I've not been able to check this out). Pump can't be programmed from a computer. You can clip 'fashion' colour plates over the top. This is the narrowest pump, and so the one that makes the smallest lump when it is worn under clothing (e.g. under a suit jacket, in a bra). Coming soon! 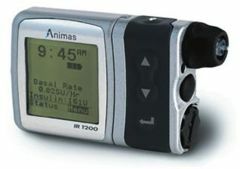 Animas 1250 - as above, but with programme in it that will calculate the carb, if you tell it what you're eating! And 'stickers' to decorate your pump with. If anyone has any trouble with these links, please contact John Davis from the charity INPUT. John has direct access to all four companies. He also has every pump currently available in the UK and uses each one on a regular basis. He will answer any questions off list, but will not recommend any particular pump. You must make your own decisions. John says: "Regarding availability of pumps. You have the right to choose which ever pump you wish, despite some hospitals saying they only supply one or two pump types. I have this from the Dept of Health, so do not accept being fobbed off". John also says: "There should be no funding issues. If your consultant says you should have a pump, the PCT has to pay for it! Contact him if you are having any difficulties". I say: "The differences between the pumps really are quite small - don't worry about making the 'wrong' choice - all the pumps work really well! I also suggest that you check out the gossip on the levels of service provided by each company". Comparing pumps on the Diabetes Mall site. Not all these pumps are sold in Britain. Insulin Pumpers and Insulin Pumpers UK are supported financially by voluntary contributions from members of its discussion groups and from all the principal insulin pump manufacturers.